slipsen man doppar i smöret. Men tusan så bra blir humöret! "The Very Best Of Swedish Schnapps Songs" kan tillhandahållas! Hur man gör för att skaffa sig ett eller flera ex av denna oumbärliga skrift framgår av sidan "Köpinfo - To Buy"! when he was trying doorbells. That is why he rang them twice. One of the Schnapps song-books Göran Rygert has published is "The Very Best of Swedish Schnapps Songs". 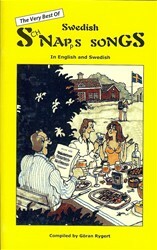 This book is a selection of new funny, and old classic Swedish "snapsvisor". One third of these 130 songs is in English. 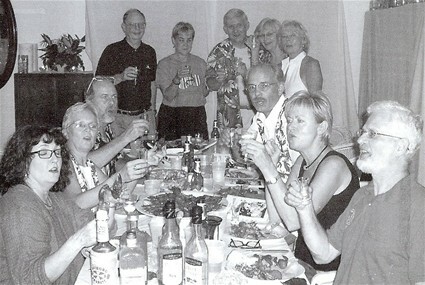 We want to ensure that everyone including non-Swedish guests at your party will feel welcome and included! others. These songs can be used for both evening gatherings or alone in the morning, for vegetarians, and for those who are just plain thirsty! If you want to buy it, just click on the column.